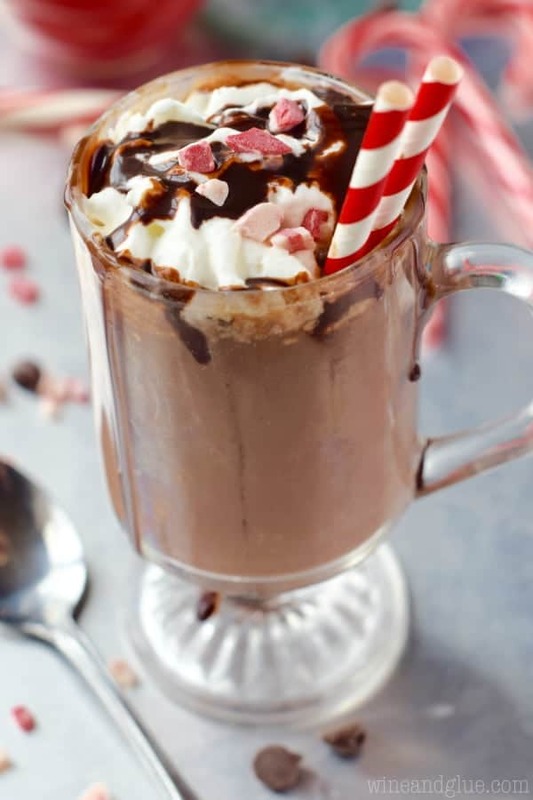 This Peppermint Hot Chocolate is absolutely delicious as is, but is amazing and so fun in it’s grown up version! Thank you Horizon for partnering with me for this fun and perfect winter drink! Do you guys remember how I mentioned the other day how hard the holidays feel for me? So I feel like as hard as the holidays are for me . . . . I want them to be that magical and amazing for my kids. Which could explain why I do ALL THE TRADITIONS. Advent calendars (one for each kid . . . #spoiled), Elf on the Shelf, St. Nick Day, going to look at holiday lights, gingerbread houses, making cookies for santa . . . . all of it. And they love it. I mean, duh, sugar and presents, what’s not to love? But they love every little piece of it. They talk about the traditions that we haven’t gotten to yet in anticipation. They talk about the one we just did yesterday with an affection and love, like it’s already been a whole year since they had it. It’s amazing and so sweet. And it makes all the loss that feels so tangible at the holidays that much easier. And the snow. The snow and the hot chocolate afterwards. It’s a more recent tradition, but one that they are absolutely loving. Like if you spend some time outside, your reward should obviously be some hot chocolate. You guys . . . I don’t do the snow. Or the cold. But you know what I do enjoy? A chocolatey cocktail. 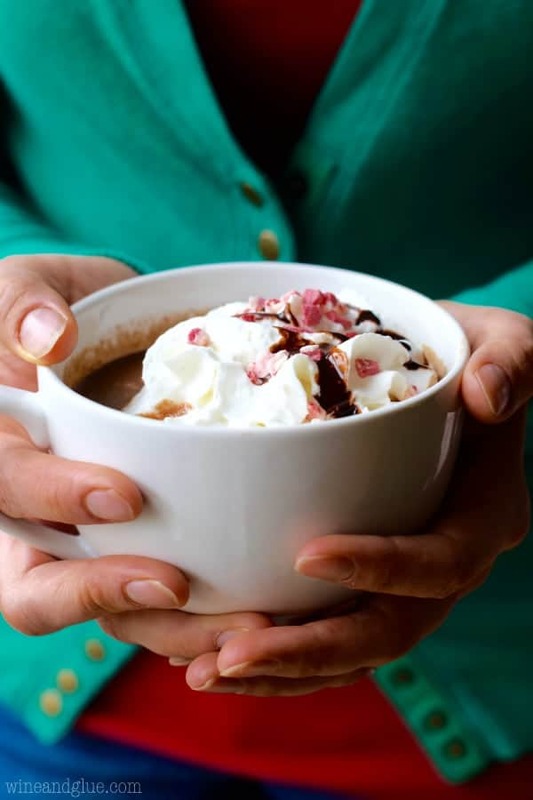 Which is why I feel really good about adultifying this Peppermint Hot Chocolate for you. 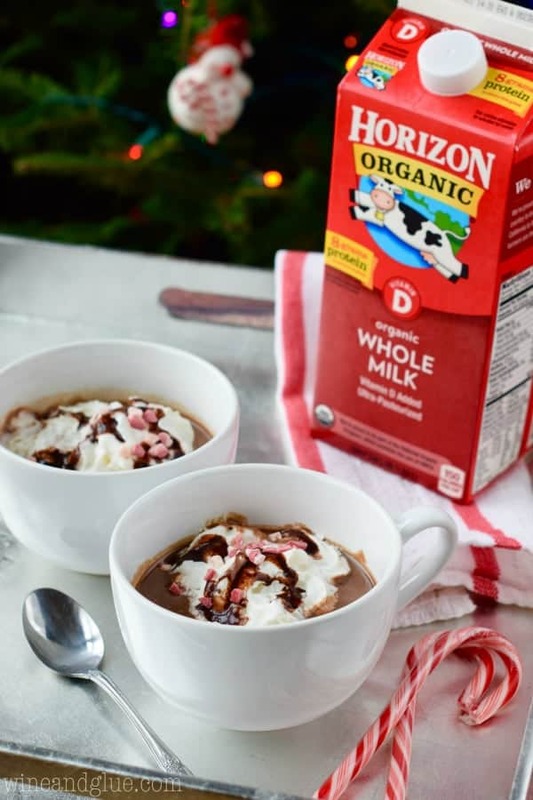 It is made absolutely perfect and amazing with some Horizon whole milk, chocolate, and peppermint extract. And then you can adult it up with a little Creme de Cocoa. A perfect version for the kids and a perfect version for you! You guys, we love Horizon milk. We have it on hand all the time for Piper. She kind of flips out every time she sees the red carton. So it was on hand and perfect for this hot chocolate. It makes it so amazingly creamy! Combined with just a little chocolate and some peppermint extract and you have a delicious and amazing drink that seems like it’s from a fancy coffee shop. And you know, just throw in a little extra something something for the grown ups . . . ’tis the season, peeps. Make sure you check out where you can find all of Horizon’s products in your area and follow them on Facebook, Instagram, Pinterest, and Twitter to get tons of great holiday ideas! In a small saucepan over low heat, melt the chocolate with milk, stirring consistently. Once fully combined, stir in the peppermint extract. If adding the creme de cocoa, stir in. 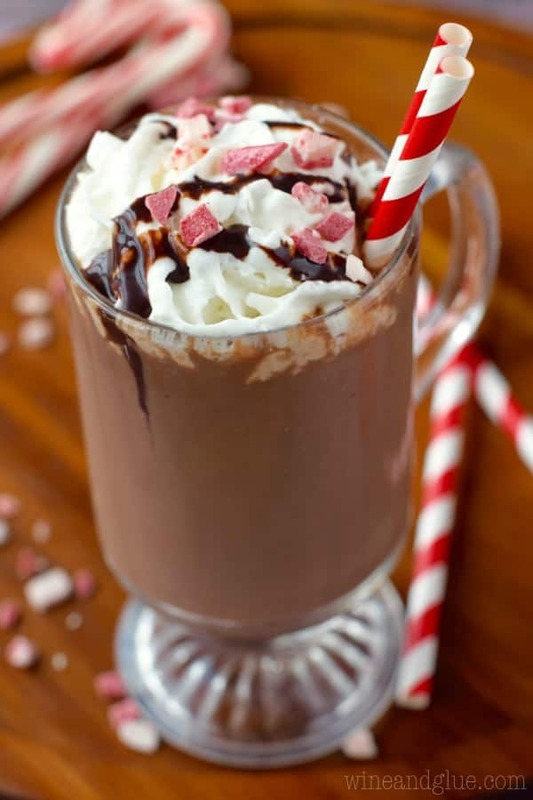 Pour into glasses and top with whip cream, chocolate sauce, and peppermint crunch candies. I am all about cozy drinks! Loving the photos! Pinned. This looks wonderful Lisa – totally my kinda hot chocolate! My kiddos love Horizon milk, too! And they would FLIP for this peppermint hot chocolate! Who doesn’t love a big mug of Peppermint Hot Chocolate??? I’m the same – I go all out for my kids and I feel like we are doing something “holiday” every night. 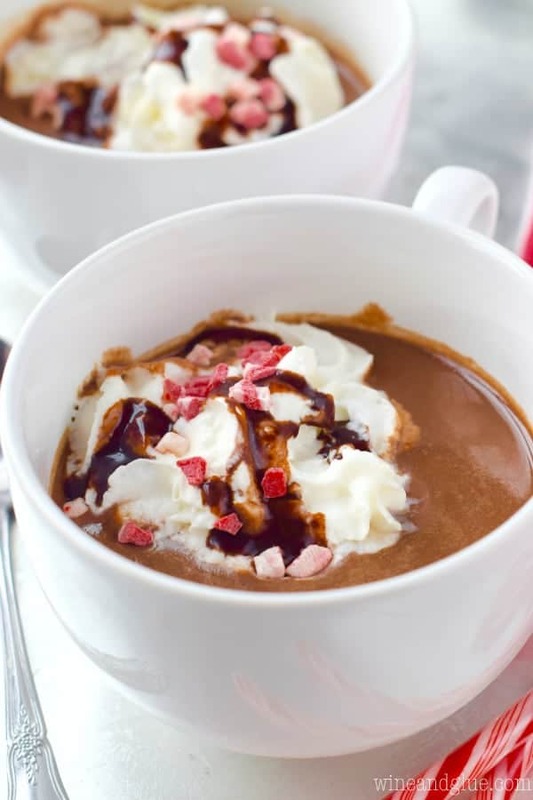 LOVE this hot chocolate – I need a mugfull right now! My kids love Horizon, naturally, these would send them over the moon! that is peppermint it love , I have yet to find a peppermint that I didn’t like. And now that I think about nor a Hot Chocolate. I hope you like it AnnMarie!